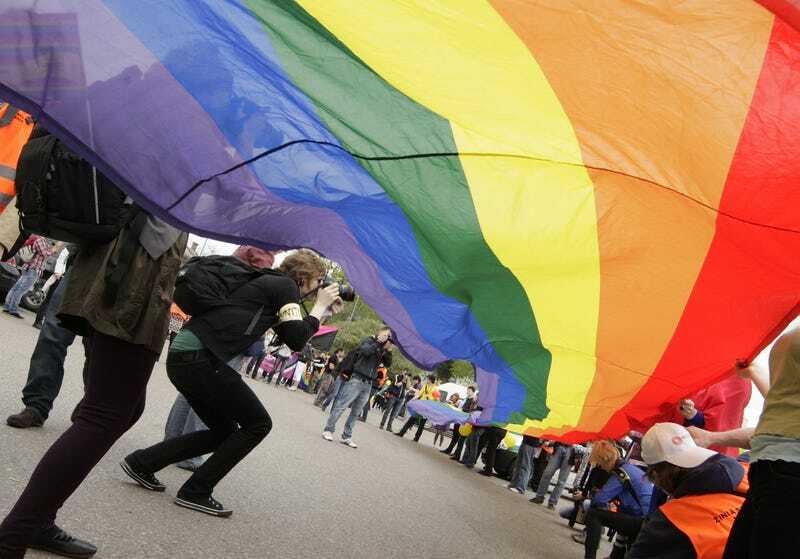 Lithuania Could Ban Pride Events, Cites "Family Values" "Morals"
Former Soviet Republic Lithuania is getting in on the discrimination game with a vote in parliament on imposing fines for LGBT activities. National anti-gay "propaganda" legislation isn't just for Vladimir Putin and the Russian Federation anymore! Unsurprisingly, the proposed legislation doesn't differ much at all from the Russian "homosexual propaganda" legislation already well known to the world. The vote is schedules for tomorrow, March 13. Public speeches, protesting supplies, posters, radio and television equipment, banners, as well as hosting or organising public events such as gay prides would result in fines 1000 to 3000 LTL ($400 to $1200), and if a repeat violator, activists could face fines go up to 3000 to 6000 LTL ($1200 to $2400), according to the legislation proposal (in Lithuanian, have fun with Google Translate) and the English explanation by the Lithuania-based National LGBT Rights Organisation (LGL). Because you know, "family values," "morals," and "please, won't anyone think of the children?!" The law would be discriminatory against LGBTI individuals, therefore in breach of Lithuania's obligation to prohibit discrimination as enshrined in Article 2 of ICCPR, Article 14 of ECHR and Article 21 of the EU Charter of Fundamental Rights, infringe the right to freedom to impart and receive information on LGBTI rights and other issues related to sexual orientation and gender identity. More evidence that the Western Europeanisation of Eastern Europe is hitting some major roadblocks for progress on social issues. First Russia (no surprise there), then Ukraine (which has quickly devolved into civil war over the conflict between West and East) and now Lithuania. I know Putin is trying to get the old band back together, but it seems he is rebuilding the empire on the backs of LGBT citizens and other "undesirables" within the former Eastern Bloc. What seems to be missing? What is best economically for the citizens of these countries, as opposed to what is best for Putin and his "l'etat c'est moi" approach to Russia's influence in international politics. The vote schedule (again, in Lithuanian) can be found here. Image of Lithuania Pride, 2010 via AP.